The Phoenix Suns have officially signed forward Alec Peters, the team’s selection with the 54th overall pick in the second round of the 2017 NBA Draft, according to a press release. Peters was projected by a number of analysts to be deserving of a first round selection before he suffered a stress fracture in his right foot, which ended his senior season at Valparaiso in early March. Peters, a prolific three-point shooter at 6-9 and 232 pounds, was named the Horizon League Player of the Year as a senior following a four-year career where he became Valparaiso’s all-time leader in scoring (2,348), rebounding (997), field goals made (790), free throws made (479) and games started (134). In 2016-17, the skillful forward was the only player in Division I to rank in the top 20 nationally in both scoring and rebounding as he led his conference with 23.0 points and 10.1 rebounds per game. For his career, Peters averaged 17.5 points in 134 games for the Crusaders and his 2,348 total points are third most in Horizon League history. Peters was named to the CoSIDA Academic All-America First Team as a senior, the 22-year-old was also a three-time All-Horizon Academic Team member. A native of Washington, Illinois, Peters was a first-team all-state selection in each of his final two seasons at Washington High School. While Alec Peters will most likely make his NBA career debut in the G-League with the Northern Arizona Suns, the minor league affiliate of the Phoenix Suns, there will almost certainly be opportunities for Peters to show off his skills at the next level sometime throughout the regular season for this young Suns team. Now it’s time from hear from you, Suns fans! 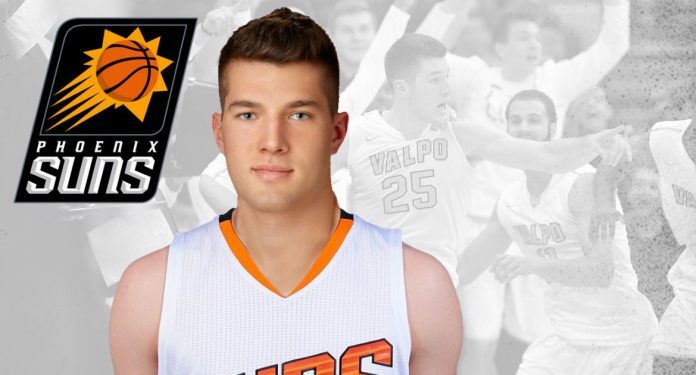 What do you think about the signing of Alec Peters? Leave a comment below with your thoughts! Next articleBring it on! Arizona Restaurant Week alive!